Today is partly cloudy, hot and humid, so grab your snorkeling gear and let’s jump in the clear blue waters of the Caribbean. Renowned for its Maya ruins, waterfalls and dramatic rivers, Belize is fast becoming a must see destination in Central America. With the longest barrier reef in the Western Hemisphere hugging almost the entire coast, it’s splendid and numerous sand cays, mangrove forests, and coastal lagoons, together earned a place on the exclusive list of UNESCO World Heritage sites. 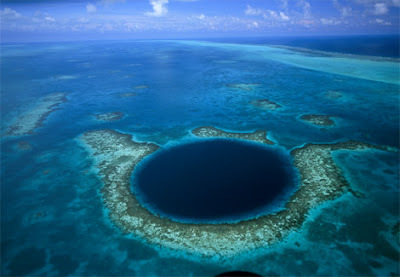 The Blue Hole, Belize’s most famous atoll, is approximately 50 miles east from Belize City. The almost perfectly circular limestone sinkhole is more than 1,000 feet in diameter and 412 feet deep. The hole is the opening to what was a dry cave system during the Ice Age; when the ice melted and the sea level rose to about 350feet, the caves were flooded, creating what is now one of the “Must-Dives” spot on our planet. The area consists of several national parks and marine reserves, including Bacalar Chico; just north of San Pedro town, Laughing Bird Caye National Park; south east of Placencia Village, and Glover's Reef Marine Reserve, which is the southernmost atoll in Belize, amongst others. Endangered species such as marine turtles, West Indian manatees, American marine crocodiles and a vast population of birdlife live in relative harmony along the barrier reef, avoiding the visitors and being carefully watched by conservationists who are keen to protect the reef's natural habitat and spectacular beauty. Half Moon Caye Wall and Long Caye Wall at Lighthouse Reef are two of the best Atoll dives in the Caribbean. Half Moon, located at the southeast corner of the Lighthouse Reef, is home to 4000 red footed Booby birds, and hundreds of Frigate birds. The island and the surrounding waters, was the first reserve to be established by the Natural Parks System Act of 1981 and are completely protected by the law. It's a National Monument and a World Heritage Site. There's an observation platform in the middle of the bird sanctuary, and in the spring you'll see the fluffy Booby Bird chicks that seem larger than their parents! Bird enthusiasts will enjoy dozens of other species that inhabit the sanctuary. Bring your binoculars! Besides birds, Half Moon Caye is home to huge hermit crabs that scuttle around the underbrush. For a demonstration of animal camouflage, try to spot the Wish Willy and Iguanas lying still in the branches of the Ziricote trees. Some of the iguanas are five feet in length, and don't worry, they're harmless, and keep to themselves. Half Moon Caye has two distinct areas. The western side consists of dense Ziricote and Gumbo forest. This is the main animal/bird sanctuary and covers 30 acres. The other 16 acres has wide open sandy beaches scattered with palm trees. Half Moon Caye is the perfect stopover for honeymooners - it's hard to believe there could be a more romantic place on earth! The area is also excellent for snorkelers since the dives sites are located close to shallow reef formations. If you are planning on a visit, keep in mind conservation and preservation when you dive and snorkel among the corals and sponges that are in an almost virgin state. Caye Caulker is a small island village (5 mile long) located one mile west of Belize’s Barrier Reef. The population of the island is approximately 1300 and has a distinct Mestizo Mayan culture, and several other cultures; the Garifuna, the Creole and Mennonite are all represented here. English, Spanish and Creole are the lingua francas. In terms of tourism, Caye Caulker is second only to San Pedro, but it still retains a small island charm. The town is still very intimate, except at Easter and Christmas time when native Belizeans descends on the island for holidays. If you think you’ll get bored here, think again. The adventures are endless! The most popular attraction is snorkeling and what better place than at the world’s second largest barrier reef! For day trips, there are tour operators, with lunch included. The most popular trips are Hol Chan Marine Reserve and Shark Ray Alley where you can get up-close with sea turtles, Moray Eels, stingrays and of course, swimming with Nurse Sharks. You can book these tours and trips with Ragamuffin Tours on the island. And if your pleasure is more leisurely, they also offer a three-day sailing adventure to Placencia Village in Southern Belize. Are you getting hungry yet? Well, there’s lot to eat and drink to fit every wallet. You can splurge with freshly grilled seafood, Belizean dishes or better yet, for the budget-conscious traveler, hamburgers, tacos and burritos can be had for as little as BZ$2.00. If you are wondering how you will get to this island, well wonder no more. You can fly in from the Belize International Airport or the airstrip in Belize City. A round trip ticket cost Bz$140 and flights depart every 2 hours. Most people come by the way of water taxi or Ferries that run every few hours from Belize City. The 45 minutes trip cost Bz$15 each way and the last boat leaves the island at 6 p.m.
Placencia Peninsula is situated in Southern Belize, and is home to three Villages; Maya Beach, Seine Bight and Placencia Village. This nature lovers paradise have some of the best beaches in Belize and its residents claims it to be the oldest continually inhabited Village in Belize. It was reportedly founded in the early 1600’s by English Buccaneers. The Villagers are very friendly and laid-back. They are often seen walking around barefooted and they would go out of their way to make sure you enjoy your stay in their Village. Getting to Placencia is either by road or air. If you have the time, driving is very picturesque and most of the roads are in good conditions. 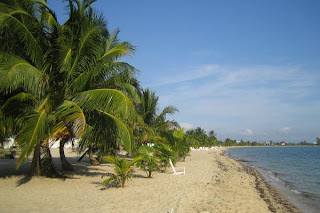 Wondering what you can do in Placencia? It’s the perfect place for relaxation! Everything on the peninsula is calm and stress-free. Main Street is simply an elevated walkway, one mile long, and it’s listed in the “Guinness Book of World Record” as the narrowest street in the world. You can find a number of accommodations, restaurants and gift shops along the walkway. Placencia is world renowned for its offshore fishing and because the world’s second largest barrier reef is just offshore, snorkeling and diving are excellent. The phenomenal blue waters are perfect for water sports like kayaking and sailing or you can hire a boat to the near-by Laughing Bird Cayes, a National Park. There are numerous tour guides in the Village that can take you to nearby nature attractions like the Cockscomb Jaguar Reserve, Maya Ruins or exploring the Monkey River. Belizeans from all walks of life descends on the peninsula for its annual Lobster Fest, held in June. The festival is filled with music, games, and Belizean beers and of course, food-- lobster in every form imaginable. Accommodations range in prices from the very luxury resorts up the coast, to the inexpensive bed-and-breakfast inside the village. Restaurants are in abundance and seafood is amazingly fresh. So, come on! Let’s go to Placencia and kick off our shoes!! Welcome to Crooked Tree Village, a neighborhood of friendly people!! Believe it or not, Crooked Tree is actually an inland island. It is surrounded by Revenge Lagoon, Northern Lagoon, Western Lagoon and Spanish Creek. 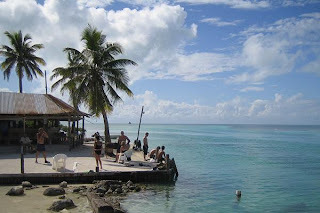 Crooked Tree is located 33 miles north of Belize City and two miles off the Northern Highway, connected by a one mile causeway. Crooked Tree has become known as a wildlife sanctuary and its annual Cashew Festival. The sanctuary is managed by The Audubon Society, after the Forestry Department, in 1984, declared the area protected under the Wildlife Protection Act. 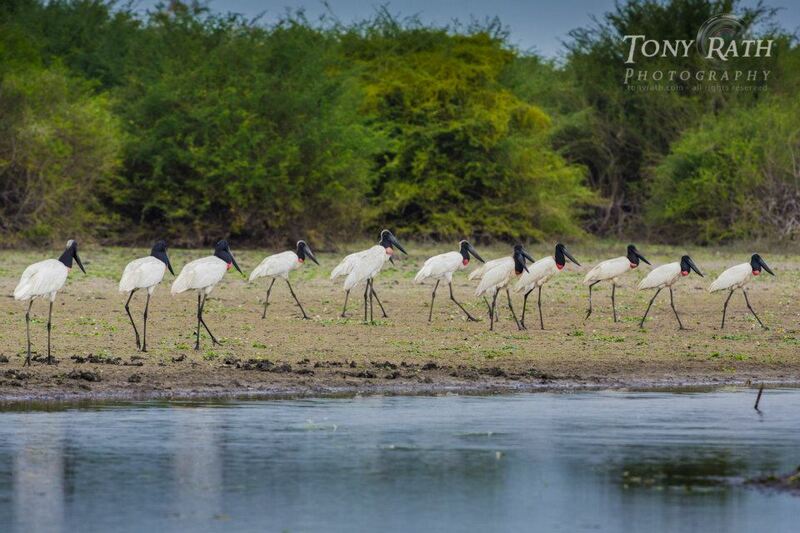 The sanctuary is home to the famous “Jabiru Stork”, the largest bird in the Western Hemisphere. The Jabiru has a wing span of 10-12 feet and is listed as an endangered species. Around the lagoons you will find many other birds feeding on the abundant food resources that the lagoons provide; the Great Egrets, Kingfishers, Ospreys, Black Hawks and many others. The entire area is a must for international birders. The traditional way of life for the Villagers has always been hunting, fishing and farming. When the area was declared a protected sanctuary, the Villagers viewed it as a declaration of war, as they felt that their livelihood and lifestyle is being threatened. A compromised was reached with the Audubon Society, whereas, the Villagers were allowed to hunt and fish on a “needs” basis to meet their domestic demands. The Cashew Festival is an annual celebration of the harvesting of the Cashew Nuts and is held the first weekend in May. The festival started with one man’s vision, Mr. Rudy Crawford who initially thought that his Village could be self sustaining. The festival is a community event to market their local products from the Cashew crops and includes roasted cashew nuts, cashew wine, cashew jam, cashew cake and an assortment of local delicacies. Preparing the nut is a very lengthy process which requires a lot of patience. It is roasted over an open fire, after which it is broken from its outer shell and roasted in an oven. Because it is so time consuming, it makes it very expensive on the open market. Here’s a list of visitor’s information and sanctuary rules from the Audubon Society. Entrance fees are Bz$2 for nationals and BZ$8 for non-nationals. Opening hours are 8 a.m-4:30 p.m.
To help maintain the sanctuary's pristine condition, we ask that all visitors observe the following regulations. Please register at the visitor's center. Please do not harm or capture any animals or birds. Please do not collect or remove any plants or trees. No fishing or hunting for non-nationals. No firearms allowed. Do not litter and please leave trash in bins provided. Please stay on the trails and boardwalks. Bring sturdy shoes, sunscreen, insect repellent and plenty of water. No matter what time of the year you visit, Crooked Tree Village is a pleasant experience with friendly people and natural beauty. With camera in hands and eyes focused, we set out last June 2008 from the Village of Carmelita, via the New River Lagoon to the Mayan site of Lamanai. 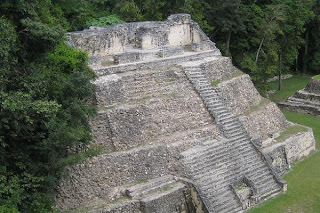 Lamanai is one of Belize’s largest ceremonial Mayan centers. The name “Lamanai” comes from the word “submerged crocodile” in the Mayan language. The trip down the river is scenic, and we were ready to capture the many species of birds, howler monkeys, bats and yes; crocodiles. The site is situated along the New River Lagoon and the central area covers approximately half a square mile. It features Mayan architecture of temples and palaces dating from 1500 B.C. and 1500 A.D. periods. 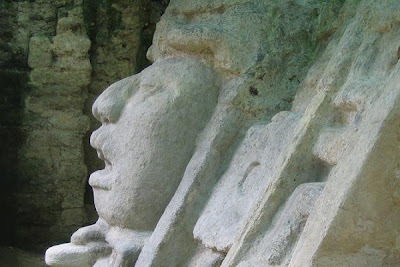 Lamanai during these periods encompasses all of Belize’s major phases of Mayan civilization. The central area, plus the other minor structures covers over 950 acres. The massive main temple is the largest Pre-classic structure known in the Mayan world and one of the longest occupied Mayan cities. A trip to Lamanai is well worth it and make sure to bring along insect repellant. This Mayan site Caracol (The Snail) is the biggest in Belize. It is located in the Chiquibul Forest, Cayo District and was discovered in 1938 by loggers. Caracol covers 30 square miles of thick jungle, five plazas, an astronomic observatory and archeologists have identified over 35,000 buildings. The most imposing among them, a massive pyramid, (Caana) is capped by three temples and rises over 140 feet (44 meters) above the jungle floor and is considered the tallest man made structure in Belize. In 1986, an elaborately carved stone was discovered which described a victory by Caracol over Tikal, located over 60 miles away in Guatemala. This discovery positioned Caracol as the supreme Mayan City. It is estimated that over 200,000 or more Maya lived in the area when this City reached its peak around 700 A.D.
Today, Caracol and the surrounding area are rich in tropical flora and fauna. Archeological excavation and reconstruction of the site is ongoing during the dry season. This site is definitely worth a visit; it offers a glimpse into Mayan life. On your way out, make sure you check out the visitor’s center, you will find a number of photographs and diagrams of the site, along with artifacts and a recovered ceremonial altar. This is very good and the way you cover different location was a good way to promote tourisim in Belize. Keep up the good work it is very interesting and it hold my attention to the very end. This is very good and the way you cover different locations is a good way to promote tourism in Belize. Keep up the good work it is very interesting and it held my attention to the very end. Way to go, bring it on to show the Belizeans that they have to step up to the plate and support our country. If you live in USA start to send your stuff back and build up Belize as a world class country, Belize need as much support as it could get. Thanks for the development of Village View Post and other news and information about Belize. It's a good read for all. Keep up the good work and a big well done Linda..
You are doing an excellent job! Keep it up. Thank you so much for connecting Belizeans abroad to Belizeans at home. I have so much more pride learning around my rich heritage. Also, these pictures of Belize are so beautiful. I am using them as my desktop background at work.